Contact the Welcome Center for help choosing a new primary care doctor. David practices physical therapy in the Spine Physical Therapy Clinic at the UW Health Research Park Clinic. He treats individuals with functional limitations due to a wide variety of orthopedic conditions, including conditions affecting the back, neck, hip, shoulder, knee, elbow, foot and ankle. David is a certified clinical instructor serving student internship programs. He is licensed by the state of Wisconsin for physical therapy. 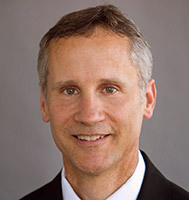 David holds a Bachelor of Science in Physical Therapy from the University of Wisconsin-Madison and a Doctorate of Physical Therapy from Simmons College in Boston, MA. He is a board-certified orthopedic physical therapy specialist by the American Physical Therapy Association (APTA). He is a member of the American and Wisconsin Physical Therapy Associations and the APTA Orthopedic Physical Therapy Section. David holds an Advanced Clinical Instructor Credential by the APTA. Medical interpreters are available to help patients communicate with hospital and clinic staff. For more information, please contact interpreter services at (608) 262-9000.